With enriched search experience, explore your data and the applications that is critical. Understand data through its meaning, specification, structure or quality assessment. Search is no longer simply on the characteristics of information but across its usages and dependencies, such as term or rule assignment, user access or ownership, consumption. Use data lineage reports to gain additional insight into data structure, quality, assessment, usage and preparedness for a compliance strategy. Learn to manage and publish a glossary to represent your business language. Enable a set of governance policies and rules to establish the format, identity, ownership, usage and access to the data contained within your catalog. Trace which applications and analytic services are using what data. Capture and display data consumption across the enterprise. 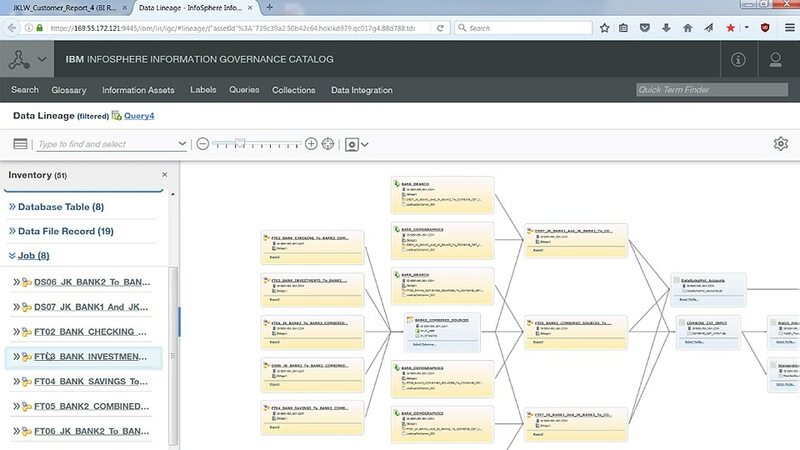 Leverage data lineage and compliance assessment reports to track data from source to service. Learn how to describe, tag and annotate data to better facilitate discovery, enactment and usage. Develop a stewardship process for adherence of policies and tenets of governance. Provide a comprehensive view of data while managing risk and driving growth opportunities. Integrate unstructured data through our StoredIQ offering and bring a truly holistic view across the enterprise within a single data catalog through common classifications and language (glossary). With Apache Atlas, allow sharing of classifications and govern data in Hive and HDFS stores. Enhance the process of governing information through identification of the type and meaning of information and application of quality or standardization rules with the classification and discovery services. Use the actionable rule framework to support the workflow and implementation of rules. Use the dashboard capabilities for reporting the metrics or statistic and adoption of information for governance and quality assessments. Gain access to the unified governance & integration platform offerings via Flexpolicensing. It supports your rapidly evolving business needs by giving you flexible access to the offerings included in the platform. Purchase entitlement based on your expected needs. When your business requirements change, gain the flexibility to add or stop using a product and apply the same flex points to another offering within the platform, as long as you stay within total flex points purchased.